We’ve been on a mission to protect the world from internet-based threats since the launch of our enterprise security product, Cisco Umbrella (formerly OpenDNS), in 2012. We talk a lot about what our product can do and the threats it’ll block you from, but we don’t talk enough about the research team that powers our product and how they do it. Today, we’re changing that. Introducing Threat Busters: A new digital adventure where you can access our team’s latest security research and hunt down threats in a retro, underground cyberworld while you do it. If you’re feeling competitive, find as many “Easter eggs” as you can to boost your score and join our Leaderboard. The site is live with content on malicious cryptomining, ransomware and phishing and the cyberattacks XBash, DanaBot and Roaming Mantis. We’ll continue to add new threat and attack content monthly, based on what we see happening in the security space. With 16,000+ enterprise customers in over 160 countries, we have a unique view of corporate internet traffic. For both malicious cryptomining and phishing, we’ll show you traffic by company size, vertical and geography, as well as the overall traffic trend for December 2018 through February 2019. 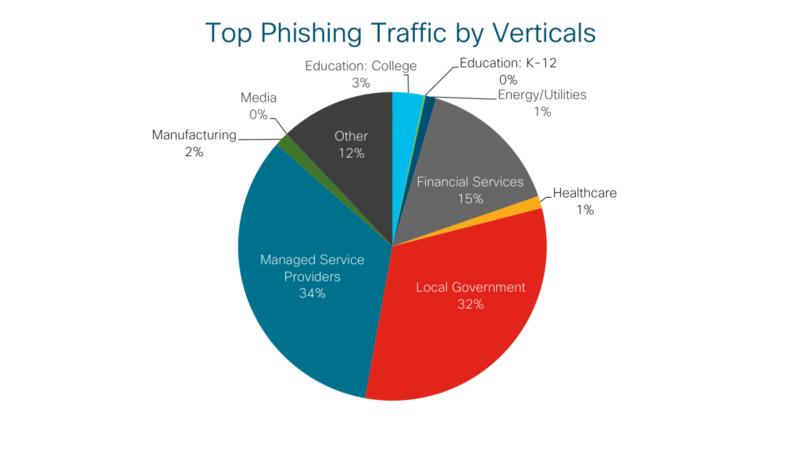 Above is a pie chart showing top phishing traffic by vertical for the period December 2018 through February 2019. Traffic trend graphs for ransomware are coming soon. It might be enough for you to know that Umbrella blocks these threats and attacks, but have you ever wondered how it’s actually done? For each threat and attack featured we’ll tell you how our team blocks the threat in question, from using open-source intelligence (OSINT) to algorithms and everything in-between. We also include a list of Indicators of Compromise (IOCs) on the attack briefing pages. We do this so that any member of the information security community can use them to identify potentially malicious activity on their own system or network and improve early detection of future attack attempts using the intrusion detection systems (IDS) and security information and event management systems (SIEM). What cyber attacks are roaming the internet? We’ll handpick current attacks that we see roaming the internet and give you background on the threat, how Umbrella blocks it and illustrate how the attack works. Cisco Umbrella, also benefits from the Talos Security Intelligence and Research Group. We leverage their threat intelligence to help detect, analyze and protect against both known and emerging threats. Take the first step to making your organization more secure.